Ecosmart’s tankless water heaters are very popular because of their excellent price / performance combination. Thanks to Ecosmart technology, they are more affordable than similar tankless water heaters while performing equally well (if not better). 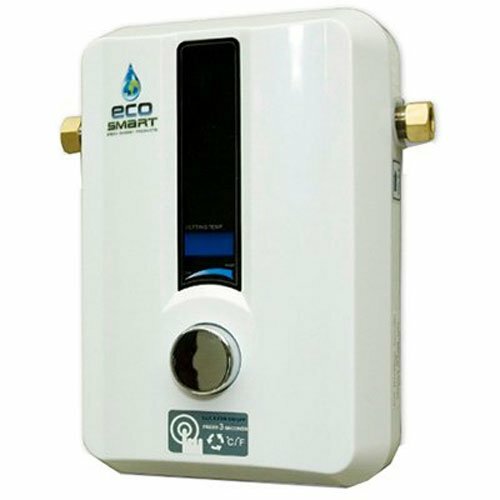 The Ecosmart ECO 8 8KW Electric Tankless Water Heater is one such unit. Similar to the Ecosmart 11 kW previously reviewed on this site, the 240-volt unit carries the company’s patented self modulating technology. The Eco 8 shares the same features of the Eco 11 (like the stainless steel heat exchanger and digital temperature control) except that it requires less in power: 40 amps from a double pole circuit breaker, #8 gauge copper wires, and a 100 amp panel. It also uses ½” NPT fittings. The Eco 8 is ideal for use in regions with incoming water temperature of at least 67oF, and can heat up to two gallons per minute (2 GPM). Adjusting the temperature is quite easy because you can set it in increments of 1o. A remote control is sold separately. The unit can also be used as point-of-use in colder regions. The unit is quite small at 12” x 9.75” x 3.75” and can easily be placed in a storage area, leaving you with room to spare. It is also inexpensively priced (somewhere in the vicinity of $200). Similar to other units in the ECO line, it has an energy efficiency of 99.8% that translates into a 60% reduction in water heating costs. Ecosmart’s own self-modulating technology allows you to receive hot water at consistent temperature and consumes power sufficient enough to heat the water. The unit has a 30-inch pig-tail cable attached to the housing. An electrical box with terminal screws is necessary to connect this to the supply cable. Check your existing electrical setup to determine whether you’d need to make an additional purchase. According to the owner, this particular information was not mentioned in any product listing and even on the website. For households with low water heating needs and/or for point-of-use usage, it’s hard to find a water heater better than the Ecosmart ECO 8. This electric tankless water heater really is a good buy if you intend to use it for light loads. Always check whether the tankless unit you are purchasing is the right choice to address your needs.